After a hard week of study or work there's nothing you want more than going out at night, and everything must be perfect. This is the idea that has inspired these incredible shoes. Magic Ballerinas® are shoes with a light and compact design that can replace your regular footwear whenever you need. Just put them in your handbag before going out and they'll be there when you need them. What girl doesn't like to wear some beautiful high-heel shoes? We all know how hard and uncomfortable it is to be gorgeous at all times, but you also need to pamper your feet! Don't let pain spoil your night or come back home barefoot. Use Magic Ballerinas® instead. 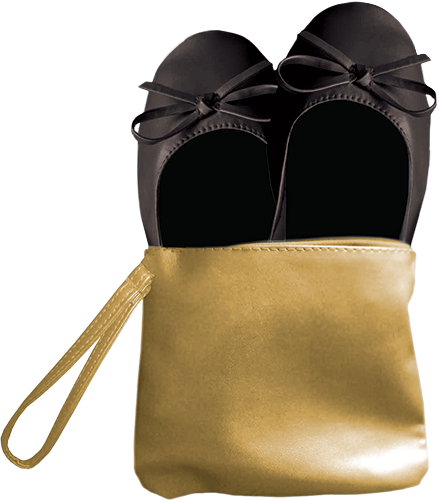 Magic Ballerinas® come in a fashionable wristlet so you don't lose any of them. Magic Ballerinas are the ultimate solution to always look great and have relaxed feet. You can find them anywhere. We have set an affordable price so you can spend your money on what really matters: enjoying yourself! We are very happy to talk to our customers. Even if you're not one of them yet, don't hesitate to get in touch with us to solve any queries. We don't share your personal data nor send advertising. Your words have arrived. We will get back to you shortly. Please check that you've filled in all the fields properly.